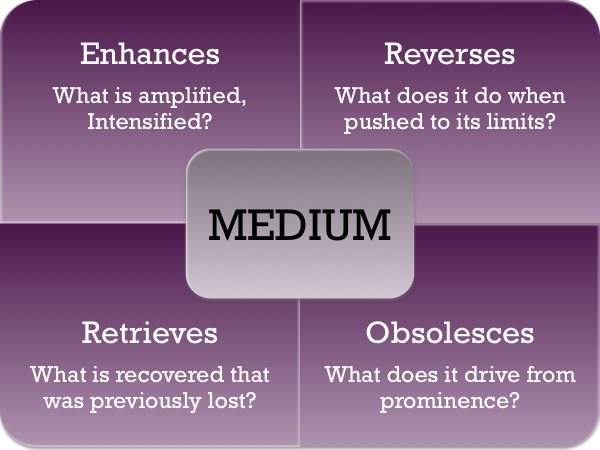 If the medium is the message, what is the cultural message of a new medium? If, as we have been discussing, the new media, and in particularly social networks, have been delivering such an enormous quantity of conversations into our mailboxes and our minds each day, it is important for us to look at the process of shaping the culture that is involved here. There are, I believe, two dimensions to look at. The first is what these media, as media, manifest about the cultures that create them, as well as what their own cultural message may be. The second is how can new media be used to shape discourse and create culture? We will discuss the first question today and the second in next week’s post. When asking, “What is the cultural message of a new medium?” I am looking at the media through the lens that Canadian philosopher Marshall McLuhan offered us when he enunciated his famous dictum, “The medium is the message.” While we can look at the abundance of new media tools, platforms, and connections and ask about their role in connecting contemporary culture, it will be important for students of communication to have a careful look at each of the new media to determine what kind of message it sends simply by being what it is and working in the fashion it does. Here are some of McLuhan’s distinctions that might provide starting points: for example, his distinction between hot and cool media in terms of its impact on the perceiver as well as the intentions of the sender. Generally speaking, hot media engage one or more senses rather completely and demand little interaction, while cool media require more participation to fill the gaps. What media and aspects of new media operate in one way or the other? Does this say something about the propensity to contribute or to lurk? This will require careful research and study, so I have to be satisfied with simply calling attention to this side of new media and their possible impacts on the users (the medium is the massage). I leave it up to experts in academic communication departments and think tanks to provide the workforce that will help us to understand what is happening to us as end-users of each medium and how their extensive use may shape culture. What changes when we use different forms of new media? What does it enhance, what is amplified, enlarged, intensified? What does it obsolesce, what drops in prominence or even disappears? What does it retrieve, what is recovered, brought back of what was previously lost or diminished? What does it reverse, what does it do when pushed to its limits? Movement in any of these directions may affect the culture of the users, for example the mass availability of cell phones seems to have significantly increased frequency of communication in some cultures where people were inclined to be more taciturn in face to face situations. The documentary, McLuhan’s Wake, uses the cell phone as one example of these changes: the cell phone enhances the free use of the voice; it obsolesces the phone booth; it retrieves childhood yelling (to the point where we have coaches on the train that are “zen,” where cell phone conversations are forbidden); when pushed to its limits, it reverses freedom from the wire and becomes a virtual leash for those who cannot be without it. So the starting point for inquiry here is probably sharing your own experience with peers and across generations as to how your life has been affected, changed, as new media acquired more prominent places in your life and work. Such discussion should provide suggestions for more in-depth research. How do new media emerge from culture? McCluhan also observed, “We shape our tools and thereafter our tools shape us.” This should not surprise us as interculturalists, knowing that what we make in the world, scooters or cellphones, are products of our inner discourse. We make culture and culture makes us. When we’re talking about media, new or old, we are talking about ways we have projected our culture on reality. They are part of our culture. So, the question is how, from what discourse, and from what need the development of new media tools and resources emerge. While the possibilities seem infinite, still what we create emerges from discourse we have about our needs and ourselves. Here’s an impossible question, but I find it fascinating to speculate on: what the Internet and new media would look like today, if their birth and infancy had occurred through the efforts of housewives rather than the exigencies of the 1950s military. How much to we have to feel threatened, in order to move forward? Apparently quite a bit, at least given the prevailing expression of our primitive discourse. Today’s dominant discourse, in the socially constructed global marketplace that we live in, is Darwinian, despite the niceties we would like to embellish it with. This is rooted in the more ancestral and primitive biological discourse of survival, which at its worst is Homo homini lupus—”Man is a wolf to [his fellow] man.” This, to say the least, is unfair to wolves. “Kill and eat!” Survival shapes the first layers of primitive discourse and the stories that it tells. If we accept some validity for Maslow’s hierarchy, we must sadly admit that much of the time decisions are made in its basement, out of real or fictive insecurity and fear for one’s existence. Despite our technology and ability to create abundance, we have not been able to significantly alter or transcend this urcultural discourse. Consequently we live in a world where both primitive and high-tech slaughter, violence, and torture contribute to the opulence of the few and the deprivation of the many despite it being a place where, paradoxically, there is more than enough to go around. New media are enablers of war by drone and pinpoint assassination. To date social media have done little to change this culture of survival by violence, though they have already provided support to movements and counter movements, revolutions and counter-revolutions. Without a shift in our primitive conversations about survival, the best intended movements and revolutions ultimately re-create the problem that summoned them forth in the first place. Harold Robbins, in The Adventurers (later made into a rather bad film), shows us a cynical picture of how revolution follows on revolution as the starry-eyed thirst for justice, almost overnight, turns into the steely-eyed exercise of power. The novel is stereotypically set in Latin America, but as contemporary history is proving, it could be anywhere and everywhere. So creating discourse and shaping culture on a deeper level is the perennial challenge facing humanity, even as our consciousness grows about how the internecine wars of tribes, nations and classes over resources now threatens the human race as a whole. Those who are comfortable enough, throw up their hands and say, “Well it’s just human nature.” Alternative discourses of faith and philosophy, aimed at turning “swords into plowshares,” are quickly appropriated by discourses of fear and power and used to set the people’s faiths against each other. are fearful of cultural identity, of being labeled. This challenge of managing the larger social constructions of reality, what I have elsewhere called the “urcultures” has all too little been the focus of intercultural work and study, despite the fact that the kind of insight and tools needed to do this are more likely to be found in this field than in many others. How new are our new media? Do new media indeed bring something fresh to life or simply bring us more and faster same-old, same-old? Are they a “game changer,” a paradigm change or shift? Does the ease and abundance of communication change the shape of how we will think about ourselves or simply widen the channels for what we are already saying and doing or does it create a new dimension? Certainly given our understanding of the social construction of our realities, it’s we who are prone to bring the same-old, same-old to the construction and use of media, and we face each new development either with hope or horror, or both. There is strong tendency to look at new media as resources, goods, tools for power to be fought over, controlled, at the same time that we would like to see their accessibility is an enabler of democracy on a level not experienced before. If so, that would signal the arrival of a culture shift of significant proportions? A SIETAR (Society for Intercultural Education, Training and Research) colleague of mine in Argentina, Natalia Sarro, has raised the question in a recent blog post as to whether we possess our stories, or whether they possess us. I am sure that the answer is, both! One of the prevailing discourses in the contemporary self-development movement at the personal level is that we must change negative stories into positive ones, limiting ones into liberating ones. This is becoming a sacred, almost religious discourse in US culture, whence it is rapidly globalizing. It is, as so many values in the US, focused on the individual, premised on individual salvation. One comes to the altar to profess one’s faith, whether it be in God or in Mammon. Both deities are pretty popular these days. How do new media connect us, when they also disconnect us from each other and from our past? McLuhan’s analysis of the effects of media raises interesting questions from a cultural point of view. One of these is whether the new media are creating a new sense of community in the human family or enhancing individuation—or both. Is there anything inherent in them that leads in one direction or another? Again my suspicion is both, hesitatingly said, hoping that users and scholars will offer reflection and research on if and how this is taking place. To what degree are the human connections that new media create, “real” or rather, avoiding the essentialist tone of that question, what is the nature of the reality they construct, how does it function? A few weeks ago I was on an extremely crowded bus for the usual half hour ride home, which in this case took an hour and a half. As the bus left the station, standing room only, just about everyone under 50 (including a few over 50 like myself) was connected to their iPhone, iPod or iPad. Almost no one was talking to anyone else. When the bus ground to a halt due to road construction and traffic obstructions, gradually people put their handheld devices away and began talking to each other, both to peers and across generations, asking questions, telling stories related to our common plight. “You had to be there.” In other words, when the bus was reduced to a stop-start, mostly stop, creep, we grounded ourselves in the physical present and connected face-to-face. Sure, there were a few phone calls of the, “Honey, I’m going to be late” kind, but the focus had shifted from the distant and virtual to the here and now as people came to the presence of warm flesh and blood. I suspect this is an example of how stress reverts our discourse to more primitive levels, in this case one of tribal solidarity. 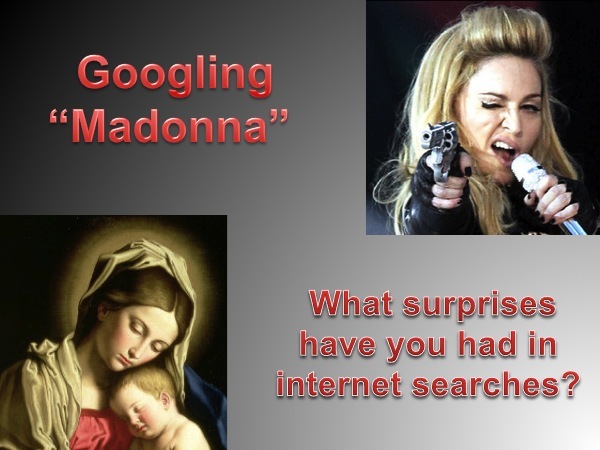 If you Google “Madonna”, most of the 230 million hits have to do with the singer, Madonna Louise Ciccone. You have to get a search a lot more specifically to find mediaeval or Renaissance paintings of the Virgin Mary, which would have been the culturally obvious meaning of “Madonna” for many only a few decades ago. 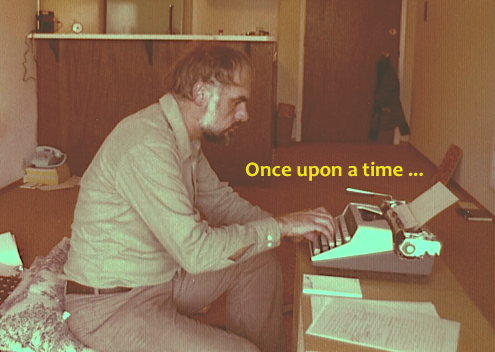 Will new media build on or over the cultural past? Will they create their own memorable cultural icons or lead us to a cultural fragmentation where identity is transitory and incidental? Should we worry about this? Culture is a discourse that requires consensus to exist. If, as Dominique Wolton insists, “Communication is cohabitation,” what is the human domestic architecture of new media for how we share the planet? We will look at the possibilities of rebranding identities that these media offer in the next post. This post originally appeared in the blog of the Center for Intercultural New Media Research and is provided with the assistance of its editor Anastacia Kurylo. This entry was posted in Core intercultural theory review/history and tagged Cultural Detective, Cultural identity, culture, current events from an intercultural perspective, Harold Robbins, intercultural competence, Marshall McLuhan, Medium is the Message, new media, Science and Technology, technology and culture by george simons. Bookmark the permalink. International Consultant, Trainer, Developer of diversophy game series, author in the Cultural Detective series. Specializing in intercultural communication, negotiation and influence skills. Member conseil d'administration of SIETAR France. Practicing poet.